When I was at high school preparing for my diploma, some weeks I was studying too much to get all the practice done I had intended, yet would be praised for my hard work. Other weeks, I would really practice, but my playing was insecure in the lesson, and I was roused on for not practising enough. It used to drive me mad. I was reminded of this recently with one of my adult students, who constantly berated herself for not practising enough, and therefore not knowing the notes. Now, armed with my Taubman training, it was clear that lack of practice was not the issue. There were just missing elements in her choreography, which led to not being able to trust the playing, and hence not being able to play as well in the lesson as she does at home. She may have not moved inside enough for a leap ending with the 5th finger on a black key, and consistently wasn’t sending herself to the next notes. Often she wasn’t adjusting the body enough or to the correct location, so she felt disconnected from her hands. It took a while for her to see that it was indeed the lack of organisation getting in the way, not lack of practice. She began to understand the need to translate the score. Instead of just cramming the note learning, to begin to analyse the movement underneath the dots: “Oh that’s a leap, there’s a scale cross which means I need to adjust my thumb behind the 2 then the 3 and move my arm. Then there’s a whole section of only white notes which is a warning for taking care of the in and out. Coming up soon I have a thumb on a black key so need to plan to gradually go in. Then the thumb lands much further down so I need to adjust my arm accordingly”… Planning the choreography doesn’t take long, but until one begins to think in this way, it is a different way of approaching the score. This thinking doesn’t mean a separation from the character and musical elements either. The bridge between the “technical” and “musical” is tone production, including shaping, timing, and the pedal, which all need to be addressed from the early stages of preparing a piece. Now I understand those difficult lessons in my high school years. For all my good intentions, I just played, without thinking about where I was going. The other major issue creating my insecure performances were all the other incoordinate elements in my technique of course, which were about to explode into injury the following year. A few weeks ago, my student announced to me “I KNOW that I’ve practiced enough. 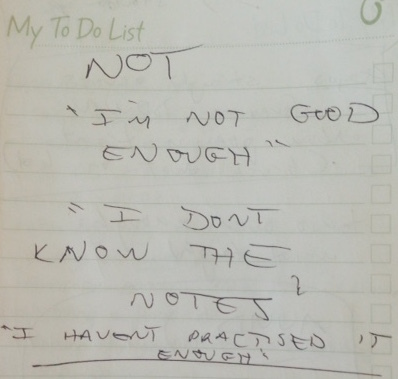 I KNOW that I have done enough practice that I SHOULD know the notes, but I feel like I still don’t”. Now that’s progress. Now we can get to work and start fixing the problems.